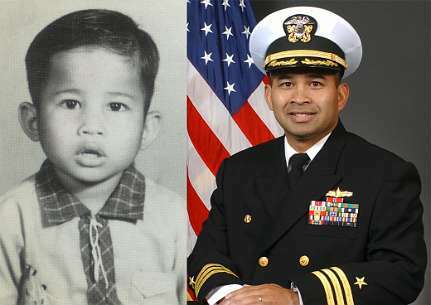 U.S. Navy Cmdr. Michael Vannak Khem Misiewicz serves as commanding officer of the guided-missile destroyer USS Mustin (DDG 89). was born in rural Cambodia in 1960 with the birth name of Vannak Khem. an officer upon graduation in 1992.
forward-deployed to Commander Fleet Activities, Yokosuka, Japan. Mustin, forward deployed to Yokosuka, Japan. For more than 16 years after moving to the U.S. in 1973, Misiewicz did not know what happened to his family in Cambodia. “Quite honestly, it was less painful as I got older to not think about it,” he said. his father had been executed by the Khmer Rouge in 1977.
later became his adoptive mother. and my adopted mom found a liking toward me,” Misiewicz said. could bring the little boy she had grown fond of was to adopt him. education in Lanark, Ill., which was his mother’s hometown. “Lanark was and still is a population of 1,500 and I think I was the only non-Caucasian at my school,” Misiewicz said. background will help accomplish it successfully. only mine, but a lot of success stories within our crew,” he said. ship to visit his birth country in a U.S. Seventh Fleet ship. chance to excel in life.